The Boston-based members of the New York Shinnyo-en Temple brought big hearts to a festive family service event on Saturday, April 13. The large gym at the Lexington Montessori School was the ideal setting for the gathering, as more than 60 participants (from babies to seniors) completed six hands-on service projects that benefited people in need. 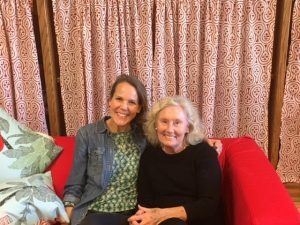 With large doses of community building, intergenerational connections, and feel-good fun, the event was an enormous success. The afternoon began with introductions and opening comments by Reverend Emiko Tsunozaki from the Shinnyo-en New York Temple, and Ineko Tsuchida, Program Director at the Shinnyo-en Foundation. 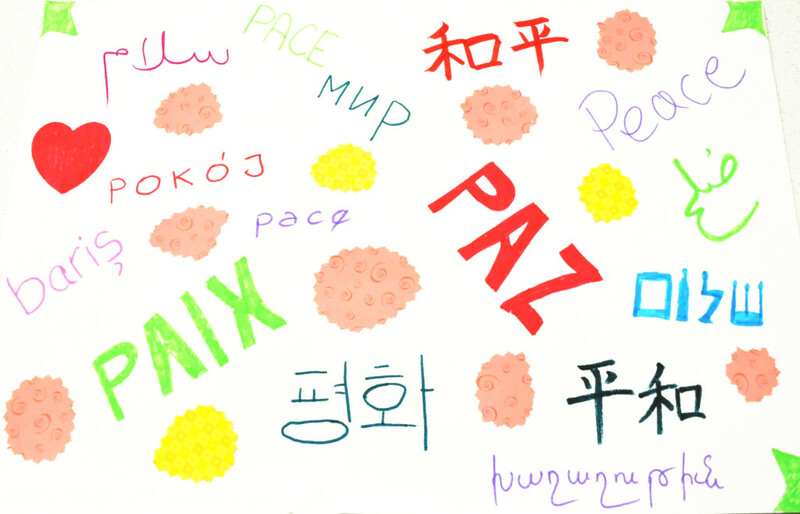 Participants learned about the Foundation’s Six Billion Paths to Peace initiative, which promotes greater harmony and nurtures future generations toward building more caring communities. Tsuchida then shared the “Tradition of Service” DVD, which movingly describes the Foundation’s philosophy, work, and impact. We also heard about the nonprofit Doing Good Together, which helped organize the event, and its efforts to help parents and caregivers raise children who care and contribute. Then the hands got busy. Some participants stopped at all six “stations” to make projects, while others focused on one or two. Here’s what was accomplished in only two hours. Participants made dozens of placemats for seniors served by Minuteman Senior Services, which offers a variety of services to seniors, people with disabilities, and their caregivers. 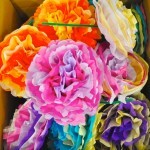 The placemats were collages made by cutting out lovely papers and gluing them onto large sheets of paper. Minuteman plans to laminate them so they can be used multiple times. 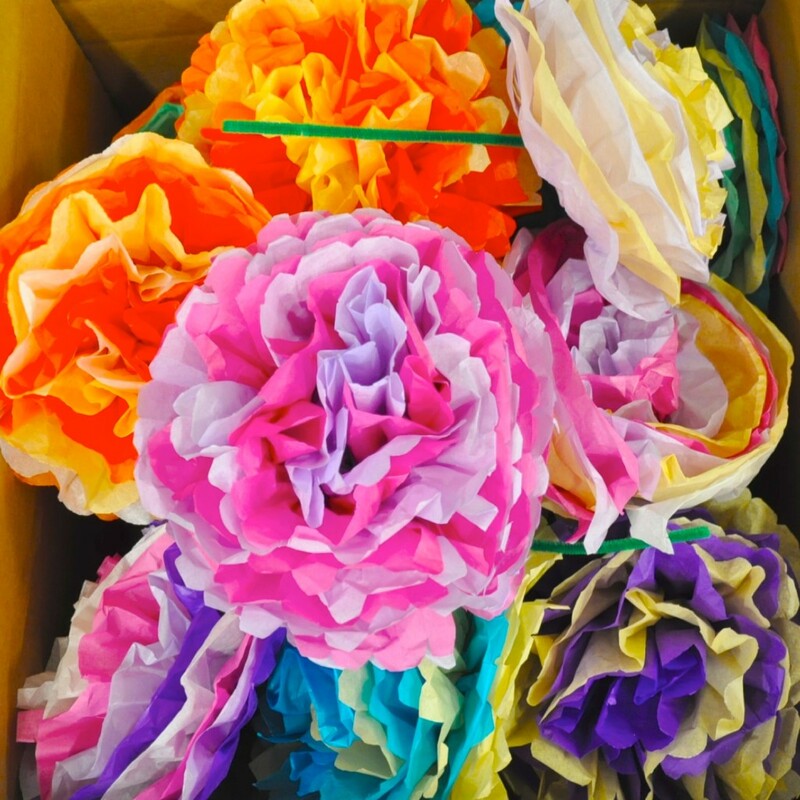 Participants created tissue paper flowers to be used as centerpieces in the Minuteman Senior Services dining rooms. (Several participants spent the entire afternoon here!) The results were colorful and stunning. 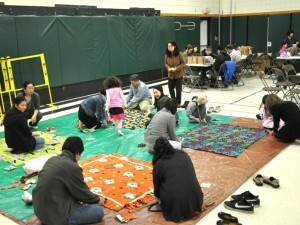 Families spread out on the gym floor and tied 13 cozy, no-sew fleece blankets for people served by the Day Center of Waltham, an organization that provides a warm and welcoming place for the homeless and those who may feel alone and isolated. 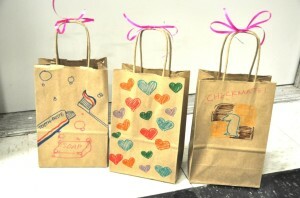 A group assembled “hygiene kits” by filling 100 decorated paper bags with shampoo, toothpaste, toothbrush, soap, deodorant, and cards with uplifting personal messages. The kits will go to individuals served by the Waltham Day Center. 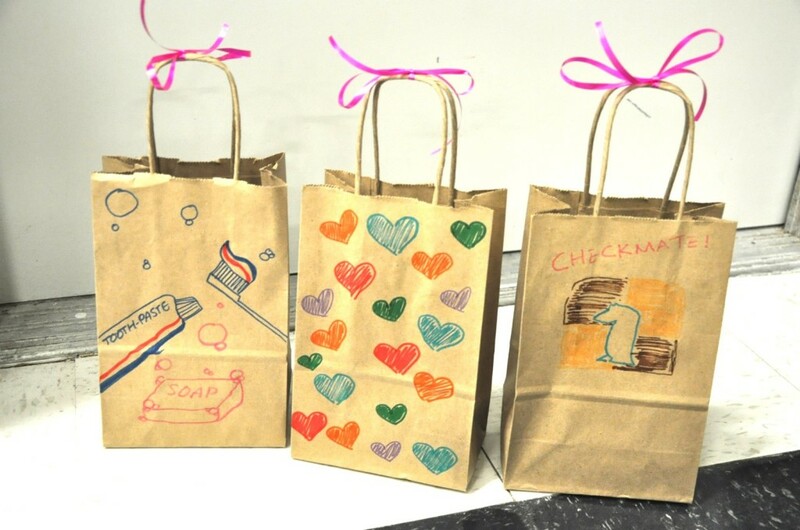 Participants diligently filled 48 birthday goody bags with a handmade bookmark and eight small toys for a group called Birthday Wishes, an organization that brings birthday parties to homeless children. Attendees created cards to cheer two children struggling with life-threatening illnesses, through an organization called Send Kids the World. The artistry and thoughtful messages prompted the father of one young recipient to send a lovely email describing how excited his daughter, Juliana, was to receive the cards. He wrote, “My daughter, Juliana, received your precious package today. The cards are BEAUTIFUL!!!!! Thank you SO MUCH!!!!!!!!!!!!!!!!!!!!!!!!!!! 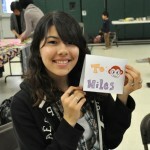 !” He included a photo of a smiling Juliana surrounded by the cards. Over refreshments, as the event drew to a close, attendees learned more about how to weave a service focus into their lives. Participants later received a resource guide with dozens of specific ideas for how they could continue to give back. The warm feeling of community and the knowledge that our efforts truly made a difference to people in need was a wonderful reminder that together we can promote peace and harmony through acts of service. Then, two days after our wonderful gathering, the Boston Marathon tragedy happened, shaking us all to the core. But it also reinforced our hope that the hearts of peace and service that were so evident at our event that day will someday help to alleviate, if not eliminate, the sadness and pain in the world.